Are you A LUCKY or COMPETENT Metal Detectorista? The story of a big gold nugget found in WA which set off the usual frenzied speculation and gold fever aspirations of a lot of dreamers last month was very interesting. Here is a link to the story and it even made the venerable ABC feature the story on the 7 o'clock news one night which shows the mystique that gold has in society. Ok, there is two things that struck us about this story, one is the "gold rush" hysteria mentality that followed the picture, whether its a hoax or not is irrelevant. For some reason people think all you need to do is jump into a car, buy an expensive metal detector and walk through the bush at Kalgoorlie to stumble over a big gold nugget. "We take illegal prospecting very seriously, with the maximum penalty for unauthorised mining recently increasing from $100,000 to $300,000 per offence, and if it continues, $30,000 every day or part day,'' Mr Roberts said. We cant confirm or deny whether a genuine big gold nugget was found as we have not seen it, only the pictures, and we do not know who found it to confirm the find. It does however raise some interesting thoughts about "Prospectors Luck" and Excuses For Illegal Prospecting! To Udo and I this is probably the most important concept of gold prospecting and Metal Detecting. The difference between being lucky and finding a good gold nugget ....ONCE IN A LIFETIME... or having the skills and competence you need to find gold nuggets MOST OF THE TIMES YOU GO PROSPECTING. and then...being able to analyse what you are finding to attempt to find the source of the gold. These things are the keys to successful prospecting. It seems pretty obvious to us - some people sneer at the idea of finding small gold without giving it much thought. However those little pieces, the sub one grammers, add up quickly to an half an ounce or so and pay for your trip. The small gold disdainers whack on a big coil that gets them down a meter or so to find a big nugget. They never really think about the intelligence that that small sub one grammer would give them about the possibility of more (much more!) gold in that location. They dont even try to analyse where the gold has come from. How can they do this if they didn't find the small nugget in the first place? Generally those people will go emu-stalking all over the bush often walking in between nuggets or over small pieces that their large coil hasn't the sensitivity to pick up so they miss a fine patch or even a significant find. That is not what we teach in our Gold Prospecting and Metal Detecting Seminars in Cue, we actually teach you to become "Masters of your Own Prospecting Destiny" we show you how to target that small gold and then analyse the gold and local geology to try to understand where the source may be (or was). ...Then, and only then, do you become part of the minority of efficient detectorista who find gold MOST times they go gold prospecting - not just rely on the one lucky big gold nugget. Then you become "Masters of Your Own Prospecting Destiny"
The second thing that struck us was the comment by Ivor Roberts about illegal prospecting. These days there is no excuse to go illegal prospecting. 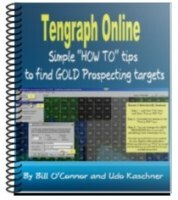 You can get free access to Tengraph which provides all the information you need to understand where you can go prospecting legally. Remember that even if tenements are granted (Green in colour on Tengraph) you can still approach the Leaseholder who owns the tenement and get permission to go on the tenement. If there is an auditable written paper trail - request, permission, report on findings and expenditure etc - then it can be claimed against the expenditure that people who have tenements must incur or lose their tenement. That page also has a excel spreadsheet that can be downloaded which is loosely based on the Form 5 reporting requirements for tenement holders. You can also apply for a Section 20a permit for $25 which enables up to 3 people to go prospecting on up to 10 Graticular Blocks on an Granted Exploration Lease for a period of 3 months (less 21 days for the E Permit holder to object if they wish). I will briefly touch on one final reason why illegal prospecting should not be an issue for you. That is the outstanding software provided free by the Deparment of Mines and Petroleum called Geomap. Geomap is a free, Geographical Information Systems viewer for Windows to view, query and overlay geological topographical and resource information. It's free and can also be downloaded from the Department of Mines and Petroleum (DMP) Data and Software Centre website with instructions at the bottom of the downloadable material on the Geomap Download from the Data and Software Centre DMP page. Layer free maps such as Geological and Topographical maps and change the transparency so you can see the features of both maps. Connect to a GPS aerial through your laptop and have Moving map so you can see exactly where you are on the ground at any time, including the Topography, Geological features and Tengraph leases. There are many other features too numerous to mention in this brief newsletter! Are you starting to see that with all these tools that excuses for illegal prospecting are rapidly diminishing! The Geomap system can take a little time and effort to understand and that is why we also comprehensively provide training in its use at our Gold Prospecting Seminars. I will put out another newsletter specifically on Geomap shortly. You will be able to get an overview of the software and its capabilities at the APLA Free Open Day Event on 9 December at the Lacrosse Clubrooms Light St Dianella commencing 11am. Make sure you put that date in your diary! On 14 November if you are in Kalgoorlie the Dept Mines will be running a full day training in GeoVIEW WA. Geomap will also be demonstrated on the day see their newsletter here; GeoVIEW Training Kalgoorlie School of Mines on 14 November. The information can be viewed by clicking on the menu item on the left hand side of the page "New GeoVIEW WA Training Sign Up Now". So that may interest you if you are in the area. GeoVIEW Training Perth 9 November. There are some pics and stories on our Facebook Page about the seminars in Cue including a nice find from Geoff Parker - have a look at his post - Geoff attended a September Seminar.